Will Iowa ever put taxpayers’ dollars where their voices are? The only thing that is self-evident is that Iowa lawmakers are not putting taxpayers’ money where their voices are: toward more and better water-quality initiatives. It’s unlikely you will hear a politician say state government is too small. But at some point, it is. Among the IPP analysts’ findings is that for most of the period from FY2002-12, inflation-adjusted totals for 10 critical water programs hovered at just over $20 million, and that there were significant drops from those funding levels in FY03 and FY11, with little rebound from the latter in FY12. 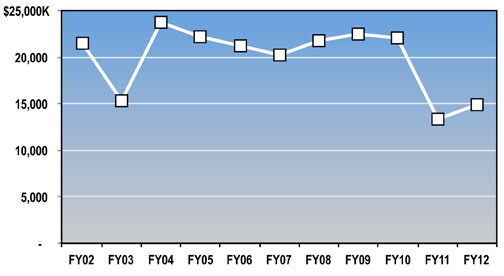 See the figure below (Figure 3 in our report). At the same time of these funding trends, we have learned that more and more waters in Iowa were impaired. One might expect greater awareness to produce greater attention to remediation, but clearly we are not seeing it. In fact, the Legislature would have to restore $5 million in state water-quality funding just to move to what it had been during the previous decade — as if those earlier levels were enough, something that is not self-evident.